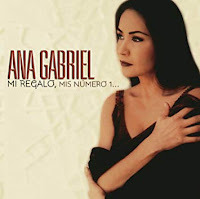 Ana Gabriel has been a very popular singer in Mexico since the late 80s. Quien Como Tu was a number one hit in 1990 and it is one of her signature songs. Though she has recorded with Juan Gabriel, they are not related. She was born Maria Guadalupe Araujo Dec. 10, 1955 in Guamuchil, Sinaloa, Mexico. She began performing at age six as Ana Gabriel. At age 15, she moved to Tijuana to pursue a singing career. Her big break came when she represented Mexico at the 1986 OTI Festival in Portugal. Her recording of Ay Amor topped the Billboard Hot Latin Tracks chart for 14 weeks. She has recorded for Columbia Records her entire career. The 1990 single Quien Como Tu established her as a star in Mexico. In the 90s she recorded an album a year. Ana can sing traditional Mexican music but she seems to prefer pop songs like Quien Como Tu which she wrote. She had a big hit in 1991 singing with Vicki Carr called Cosas del Amor. She has also recorded with Juan Gabriel, Placido Domingo and especially ranchero legend Vicente Fernandez as she is a big fan of his. This budget comp is a good intro to her music. Ana last recorded in 2015. But she appeared in the 2017 documentary The American Epic Sessions along with Taj Mahal, Bettye LaVette, Alabama Shakes, Elton John, Jack White, Nas, Los Lobos, Rhiannon Giddens, Willie Nelson & Merle Haggard, Steve Martin & Edie Brickell and Raphael Saadiq. So she's in pretty good company. Here's the video for Quien Como Tu by Ana Gabriel.